These moreish bars make a tasty mid-afternoon snack or healthy breakfast. They are packed full of protein from the nuts and seeds, including our Flax + Chia. 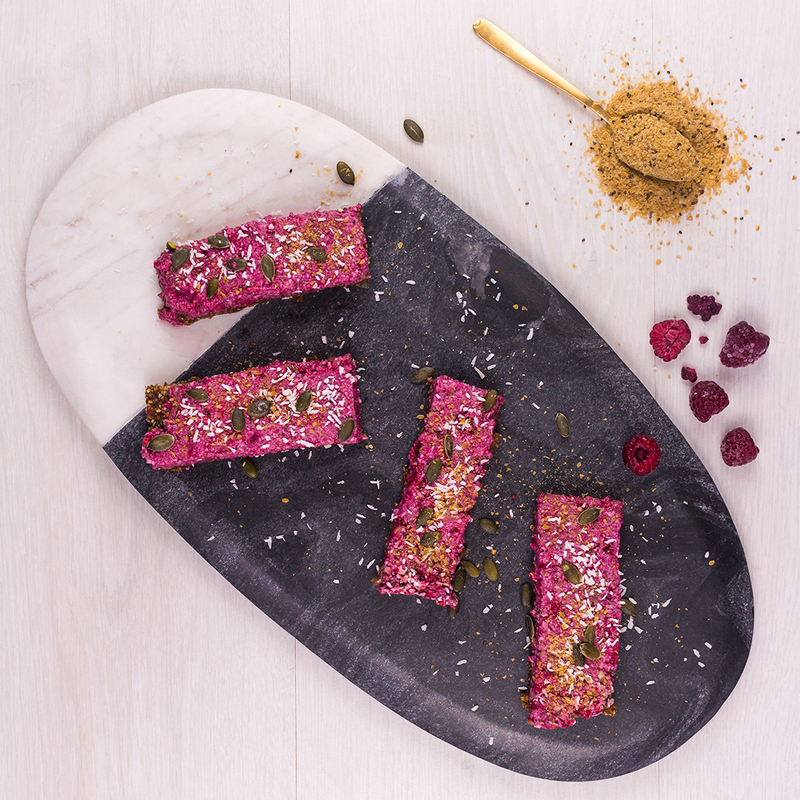 The raspberries add a delicious sweet but tangy flavour. Use different berries such as blueberries or strawberries to mix things up! Line a 20x20 inch baking tin with greaseproof paper. Place all the base ingredients apart from almond milk into the food processor and blend until the mixture forms fine crumbs. Add almond milk until the mixture becomes sticky. Push the base down into tin firmly and place in freezer whilst you prepare the top layer. Place all topping ingredients into food processor and blend until smooth. It may be best to do this in batches as the frozen raspberries make the mixture quite thick. Remove the base from the freezer and spread the raspberry mix evenly on top. Sprinkle the pumpkin seeds and some extra desiccated coconut on top. Slice into bars and store in the freezer until ready to eat. They are best served thawed slightly so remove from the freezer twenty minutes before eating.